But I’m far from alone – oysters have gone from peasant dockland fodder to the reserve of Champagne bars in the luxury quarter of shopping centres. So unless you put me on a train to Whitstable, I’ll probably avoid them in London. But this morphing of oysters into something misunderstood and inaccessible is something at the heart of The Bloody Oyster. 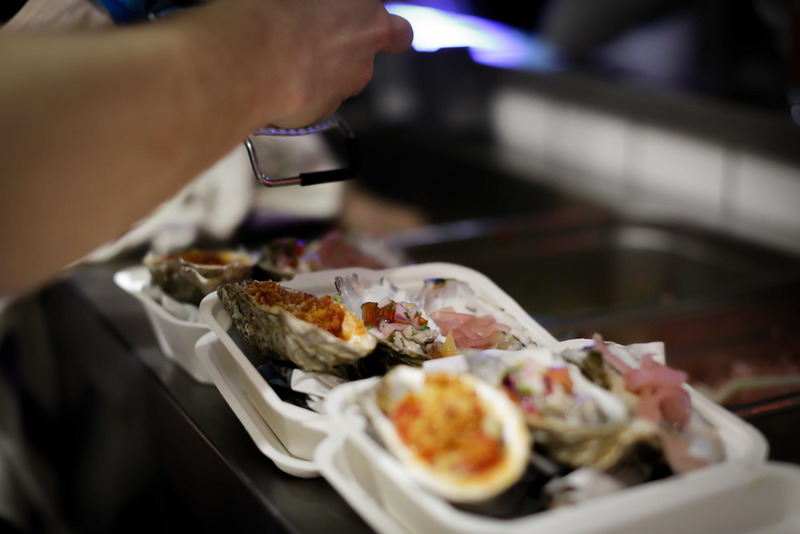 Founded by Ed Ford and Ben Hamilton, the boys are on a mission to ‘demystify’ oysters and bring them back to the masses. The crowd-funded project began, as many great ideas do, as a discussion in the pub. Following a year of pop-ups, endless shucking and kitchen experimentation, they’ve now landed themselves a spot on the Southbank this summer – in their own custom-made double decker bus fitted with a bar and restaurant. The Bloody Oyster’s recent pop-up at Dalston’s Prince Arthur on 17th May was a neat synopsis of what they’re all about. The antique, dark wood pub setting was faintly Dickensian-dockland, though I’m not sure rugged east enders of yore would have shovelled abundant oysters next to a gilded bar and taxidermy fox head. The event saw welcomingly petite native oysters served, although chef Ed rotates the variation depending on what’s available and freshest. Three versions were served on the half shell - an entry-level cooked oyster in herb and Parmesan butter, a semi-cooked ceviche oyster with lime, avocado and red onion, then a raw oyster with cucumber vignonette, all well planned and executed. Next came a Po’Boy oyster brioche, a take on the New Orleans ‘poor boy’ sandwich. 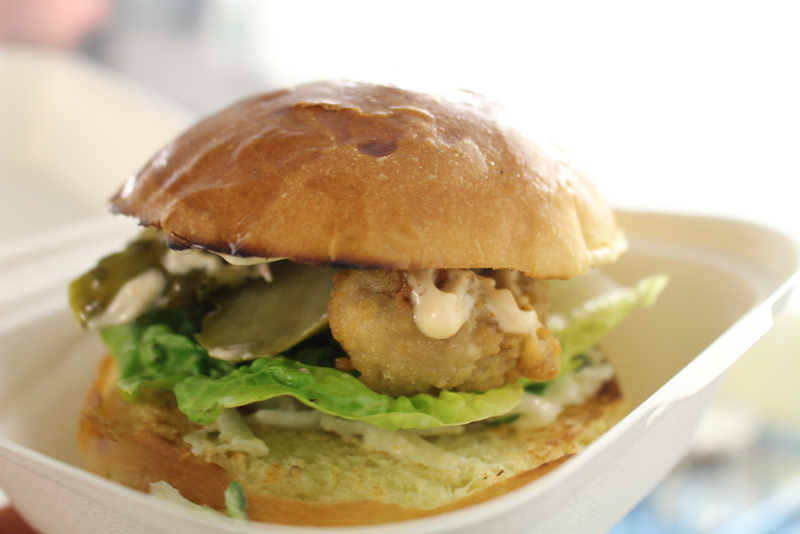 The breaded and fried oysters were served with a caper and shredded celeriac remoulade in the bun of the moment (will the brioche ever fade?). The boys pitch this as a beginners dish – if you’re unkeen on oysters, this is a safe way of approaching them. Other dishes offered depending on event are oysters with aubergine caviar, tomato compote and bacon breadcrumb and classic shallot and lemon. Ben’s bloody Marys would rouse a corpse, in the best possible way. As well as a meticulously-researched classic version, the boys’ enthusiasm for alchemy and blowtorches manifests itself in more abstract bloody Marys – a tequila, smoked rosemary and paprika base in one case, and soju (a Japanese rice spirit) and Thai basil in another. Ben says after lots of overcomplicated versions in the early days, they now take a simple but bold approach to what’s a complicated drink – and they’re always welcome to a customer’s personal take on it. After one Thai dragon BM, a pint of stout and four rounds of oysters, I’m converted to the cause, charmed by Ed and Ben’s buoyant enthusiasm, pampered by their army of friendly staff and drunk at 2pm. The beauty of The Bloody Oyster as a concept is not only that it works from morning through to night, but they’ve taken two slightly bewildering components and ran with them to a geeky degree – head to the bus on the Southbank in July and August and you’re in extremely safe hands, whichever camp you sit in.